American is awash in images of Los Angeles—it’s an iconic city, and it is responsible for creating much of the American entertainment that defines each generation. Not many people currently associate Los Angeles with environmental stewardship, but that’s changing. Through a one year funded pilot project by the Environmental Protection Agency, Clean Water Action’s ReThink Disposable program has partnered with and trained The Bay Foundation to help Los Angeles food business owners reduce plastic pollution and street and waterway litter, all while saving money! 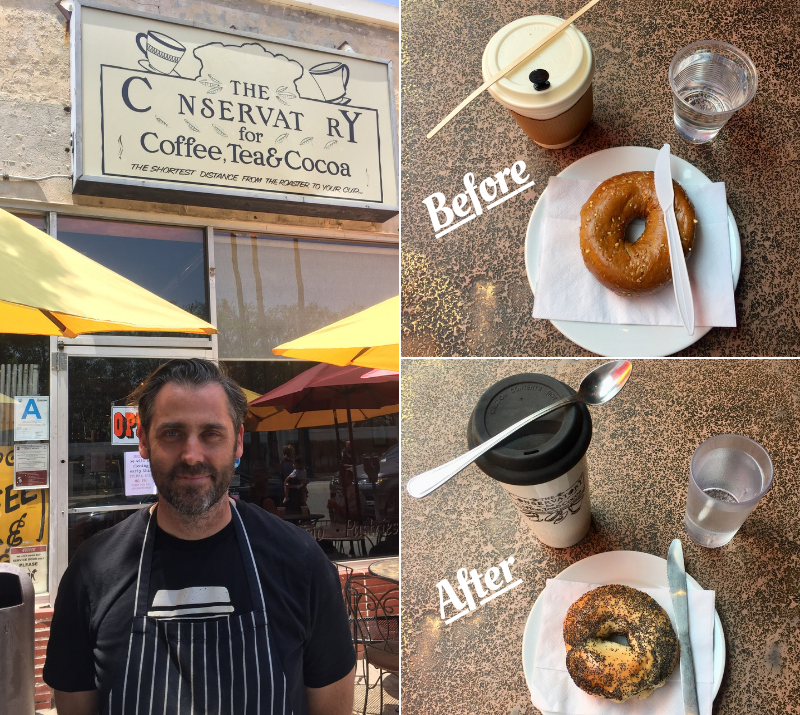 ReThink Disposable is proud to report that The Conservatory for Coffee, Tea & Cocoa, a bustling cafe in downtown Culver City, is our first Los Angeles County business certification. The Conservatory is across the street from the famous Sony Picture Studios lot where shows like Wheel of Fortune and Jeopardy are filmed. It serves coffee roasted in house as well as 100 types of tea, bagels, and pastries. The customers are a mix of tourists and locals who live or work in the area. As a result of implementing ReThink Disposable’s recommendations, The Conservatory achieved a 65% decrease in the use of disposable foodware items targeted for reduction or elimination and prevented a total of 2,005,008 disposable foodware items. The Conservatory also earned a yearly cost savings of $6,898.820 and reduced annual waste by 2,118 pounds. Stay tuned— more ReThink Disposable business certifications in the Los Angeles area are underway. During this one-year pilot project, The Bay Foundation has recruited 30 food service establishments to implement our recommendations for source reduction where impacts are tracked and quantified through the ReThink Disposable audit process. Five businesses are participating, two businesses have completed their transition to reusables and three more are in process. According to numbers from the Los Angeles Department of Public Health Food Facility Ratings, there are 36,571 restaurants in Los Angeles. If just one percent of Los Angeles restaurants became ReThink Disposable certified and had results on the scale of The Conservatory, 774,573 pounds of trash could be eliminated each year. Imagine that kind of source reduction happening in a city that people from around the world are watching.